As we write this, 1,200 police in riot gear are descending upon Gangjeong village, the site of resistance to the US/ROK naval base; 500 are from the mainland peninsula and 700 from Jeju. Last week, undercover police arrested three leaders. 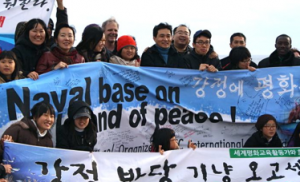 The village Chief Kang Dong Kyun was released, but Brother Song Kang Ho and Ko Kwon Il still remain in prison along with peace activist Choi Sung-hee, who has been in prison since May 19. The villagers and activists say that they are ready for nonviolent resistance to the forceful removal of their bodies from Gangjeong village. They are there to protect the land and defend the villagers of their right to preserve their community and way of life. 3. Please forward this petition to 5 friends and family. Four Americans will be traveling to Gangjeong village on July 28. That morning, we will hold a press conference outside of the Blue House and deliver this petition to the South Korean President Leeâ’s administration. We need to have 10,000 signatures. As of now, we have nearly 2,300. You can help us reach the 10,000 goal by Thursday, July 28th. Please click here. If we want world peace, we must take action together as a global community to save this island from turning from an ecologically majestic UNESCO world heritage site to a naval base staging Aegis warship destroyers preparing for war. If the Navy and government listened to local residents and proceeded with proper steps, the villagers would not have fought against the naval base construction for five years. The Navy pushes the construction of the naval base regardless of the destruction of the Gangjeong community. Not knowing the law, more than 50 innocent farmers became law-breakers and were punished. More than 50 million won has been paid in fines. And I also went to prison for the first time in my entire life. I was a coward young man hiding myself in the times of military dictatorship during the 1970s-1980s. For atonement I served in places in Ache, Haiti and all kinds of conflict areas over the world. Now I am trying to stop the insane construction of this naval base for the sake of the justice of our nation and the peace of Northeast Asia, as well as to keep the promise to the global society of preserving the ecosphere. Please take action now. We must spring into action now.